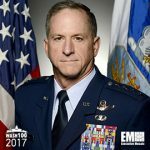 Executive Mosaic is honored to announce Gen. David Goldfein, chief of staff of the U.S. Air Force, as an inductee into the 2017 edition of the Wash100 — Executive Mosaic’s annual selection of the most influential voices in the government contracting arena. Goldfein oversees efforts to equip and train more than 660,000 active-duty guard, reserve and civilian forces within the U.S. and in overseas locations. He also serves as a member of the Joint Chiefs of Staff and acts as a military adviser to the President, Secretary of Defense and the National Security Council. Goldfein noted in January that the Air Force aims to collaborate with defense contractors on the OA-X experiment which seeks to discover a new commercial-off-the-shelf light-attack aircraft or a low-end fighter plane for close-air support missions. The Air Force has discussed the potential acquisition of Beechcraft‘s AT-6 and Embraer‘s A-29 Super Tucano to fill the role of low-end fighter aircraft. Goldfein also urged military leaders to provide recommendations to President Donald Trump with regards to flexibility for field commanders in the fight against the Islamic State militant group. Goldfein’s 34-year military career also includes service as vice chief of staff of the Air Force, director of the Joint Staff, commander of the U.S. Air Forces Central Command and director of operations of the Air Combat Command. He also served under various leadership roles with the 49th Fighter Wing, 52nd Fighter Wing, 366th Operations Group and the 555th Fighter Squadron. Goldfein recorded more than 4,200 flight hours as a command pilot with T-37, T-38, F-16C/D, F-117A, MQ-9 and MC-12W aircraft. Executive Mosaic congratulates David Goldfein and the Air Force team for his selection to receive this award.